Following Sir Gustav's introduction, Dr Quick gave an interesting presentation about how a health systems approach can assist to prevent, detect and respond to any threats which have the potential to kill millions and devastate economies. He also discussed the importance of a whole of community approach in building public, professional and political engagement to make the world safer. 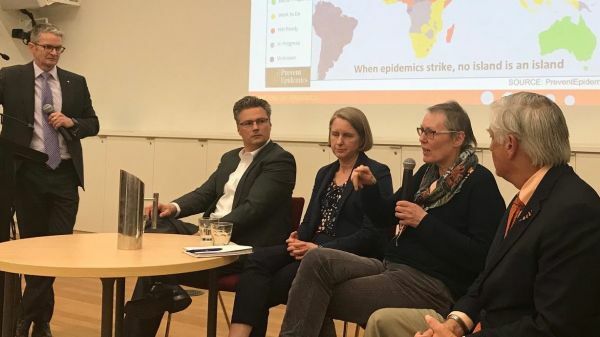 A panel discussion with industry experts followed; which included Nossal Institute's Director, Professor Barbara McPake, the Burnet Institute's Dr Ben Coghlan, and the Doherty Institute's Professor Jodie McVernon (pictured below). Laureate Professor Peter Doherty wrapped and Professor Brendan Crabb of the Burnet Institute Chaired.